Banjo fabric is regarded as the standard for convention centers, trade shows, job fairs, and other expos due to its low cost and inherently flame retardant nature. This medium weight material has a semi-sheen and features an irregular thread pattern throughout. 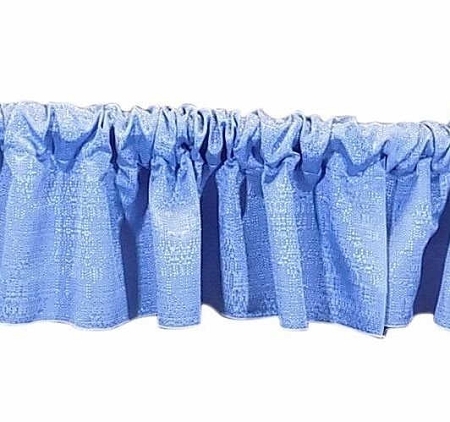 Our Banjo valance is Inherently Flame Retardant (IFR) and passes the NFPA 701 fire code. Each valance measures 12 inches tall (1 foot) x 48 inches wide (4 feet), and has a useable ribbon selvedge on each outside edge. Valance is not pre-pleated; it is sewn flat and can be gathered by hand on a support rod (crossbar). 4 inch rod pocket is sewn into the top only. Bottom is serged. Quantity 1 = 1 valance. A minimum of 3 to 4 valances are recommended per 10 foot wide span, depending on amount of gathering that you prefer. Approximately 50% - 60% opaque (light blocking). This opacity percentage is an estimate only, and for normal / standard lighting situations. A variety of factors can affect the opacity of a fabric, including where it is being used (near a wall vs. dividing the middle of a room), light sources (such as hanging in front of a window with sunlight shining in, etc. ), and the amount of gathering in the material (the amount of "bunching"). I purchased these for use at a church. I am very pleased with the quality and look of these valances.